A draft plan for the renewal of the Hubei area in Luohu District was released on December 3, indicating that a new 700-meter skyscraper is likely to be built in the area. However, amidst shock and awe at Shenzhen's impressive skyline have been voices opposing the plan to build over one of the city's vital historical and cultural areas. The draft plan, which was released by the Luohu District Government, provides a detailed look into the layout of Hubei urban village in Luohu District in the years to come. One thing that has been the talk of the town is Hubei Tower, whose height, according to the plan, will be 700 meters tall, which would surpass the Ping An Finance Center in Futian District by over 100 meters. It would also make Hubei Tower the second tallest skyscraper in the world. While many are keenly anticipating Shenzhen's new skyline in the years to come, some folks are concerned about how detrimental these changes can be to the preservation of Hubei, a 500-year-old ancient village. Among them are a group of volunteers who have been leading a campaign called "Hubei 120 City Public Plan," an endeavor to preserve and develop Hubei and other urban villages alike. "A living, breathing site with 500 years of history cannot simply be reduced to brick and mortar, and, even less so, the blueprints of an architect or planner," wrote the volunteers on their website. 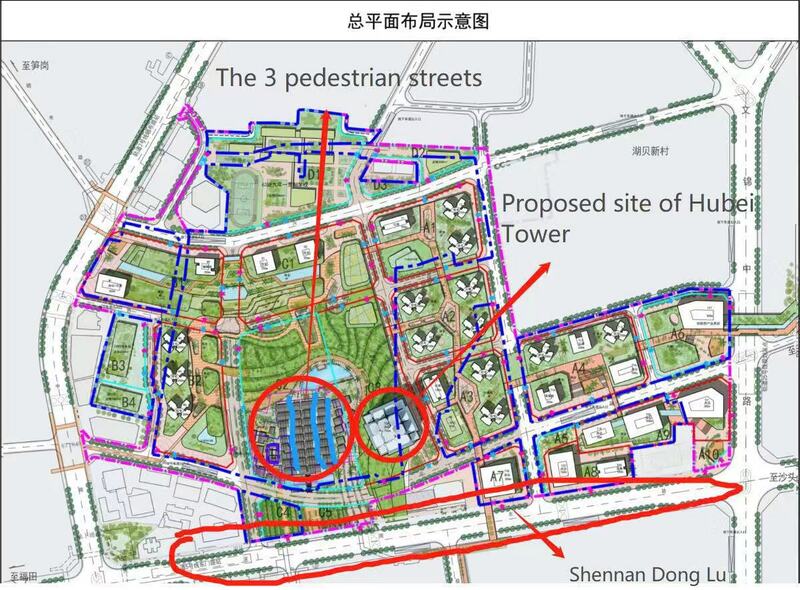 In their feedback to the draft plan published on December 6, they stated that it was not specific enough and that "while the revised height of Hubei Tower at 700 meters has decreased the size of the area to be renewed, the entirety of the ancient village will suffer more damage" with three pedestrian streets cutting through it. Map of Hubei urban village. Screengrab via Luohu Government Online. They also described the plan as 'a step backwards' amidst the country's call for preservation of history and culture, proposing that the government organize public forums to offer a more detailed plan and listen to the public's voices. Meanwhile, it’s worth noting that the height of Hubei Tower has been discussed and changed a few times over the past couple of years. According to Shenzhen News Network, the initially agreed-upon height of the tower in October of last year was 830 meters. In July of this year, that number was changed to 666 meters, before bouncing back up to 700 meters. Moreover, Shenzhen Bao'an International Airport also stipulates that any construction over 300 meters outside of the airport's clearance area should first be reviewed by the airport for approval, according to Sohu.com. Given these accounts, it is still early to say whether the building's height will be changed again in the future. Currently, two other high-rise buildings are being planned in the Caiwuwei area in Luohu District, with one being 642 meters in height (at the old site of Oriental Regent Hotel) and the other at 700 meters (700H Shenzhen Tower). 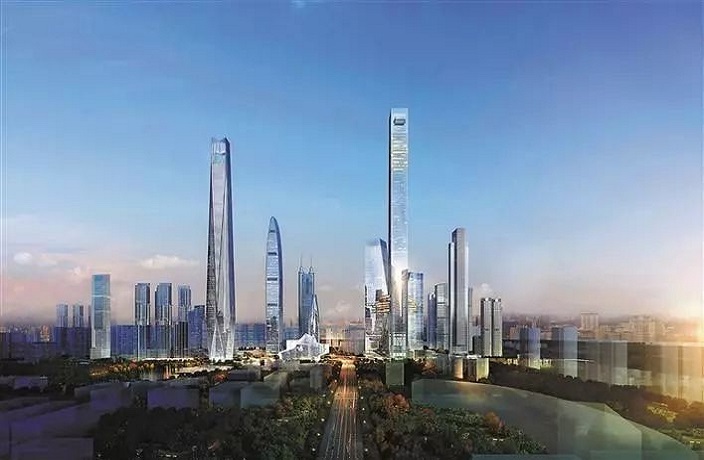 Elsewhere in Longgang, another tower called the Shenzhen Hong Kong International Center, which will be 668 meters when completed, began construction on March 26 of this year.